I generally stay away from political discussion on this blog, for one main reason, most conversations around politics result in nothing being accomplished except hurt feelings. But clearly, there is one topic that is unavoidable given the purpose of my blog, healthcare. Forget it is CNN, often referred to as “fake news.” And the two moderators Jake Tapper and Dana Bash do not hold anything back. Expect the obvious and the difficult questions to be asked. Now, the obvious. There are four participants, none are slouches when it comes to our government. All have knowledge of the needs of our country in regard to healthcare, that is, if they listen to their constituents. Two reps have an agenda to undo current health care, one rep clearly wants the current system left alone for certain, hopefully to improve upon it, and the remaining rep has his own high achieving agenda, but clearly against the other two reps. I know nothing about Klobuchar other than some interviews I have seen, and she seems to be a sincere individual. Graham, I am split with him on certain issues. I can give a “hell yeah!” on certain things, and then a “WTF! !” on others. Admittedly, his position on health care is one of those “WTF! !” moments. Cassidy, I only know of him, when he publicly proclaimed one direction for health care, and now, with his co-creator of the bill, seems to be doing exactly the opposite. And then there is Sanders. I know the most about him, because I have followed him, years before he was even a thought for candidacy of the presidency. Regardless of how anyone feels about him, he will not hold back on facts or opinions. A reason some like him, some do not. In my opinion, I consider him to be truthful and genuine in intent. And no, I do not agree with him on everything either. But I do on health care. Why Health Care Is Important To Me? I had cancer almost 30 years ago. I have more than a dozen issues related to the treatments that I received, two of which almost cost my life. Without healthcare, I will die. I remember when I was diagnosed, I had health care insurance. And then, when I had to change employers, I was left unable to get health insurance, because back then, it was legal to discriminate due to pre-existing conditions. I went through several years, lucky, or as some millenials call themselves, “healthy,” and then I got lucky with a new employer that enabled me to be insured again, only because it was a group policy, and as a member of a union, they had to accept me. Eight years after that, I had life saving emergency heart surgery, and several other episodes after that. Insurance companies are not in the money to spend money on sick people. And knowing that more than a half million dollars have been spent on my life, just cancer-related, can you really blame greedy insurance companies for wanting to take on a liability loser like me? My health history, along with other long term cancer survivors, my tab is only going to get higher. But at least with the Affordable Care Act, it became illegal to discriminate for pre-existing conditions. I will not refer to the Affordable Care Act as “Obamacare.” Using OC, intentionally carries with it, a political overtone which is meant to enflame those in debate. If you did not like President Obama, then you have to hate ‘Obamacare.” But as many have found out, with all of its faults and needs for improvement, many who did and still do not like the former president, realize they actually need the ACA. Since its signing, both parties have done nothing but spin their wheels. Imagine having 4-wheel drive, and the front axle spinning in one direction, and the rear axle spinning in the other. That is exactly what our government has done for the last eight years. One side arguing the ACA needs improvement, and did nothing. The other side, trying more than 50 times to reverse the ACA, and until this year, offering nothing to replace the ACA. BOTH SIDES ARE GUILTY!!! The Graham-Cassidy bill is being rushed for approval before a September 30th deadline. This deadline is because no Democrat will vote to repeal the ACA, whether because their constituents voiced their opinion as so, or whether just towing party line. But the Republicans have a ticking clock, allowing them to get around a normal vote requirement, having 60 votes, by currently requiring just over 50 votes. But this clock runs out this Saturday. And some in the Republican are uncomfortable rushing through this bill, just for the sake of taking advantage of this temporary advantage. Statements from several supporters of the GC bill, have openly said this, “I campaigned to repeal Obamacare, and that is what I am going to do no matter what.” You could have the most vile issues in this bill, and there are quite a few, and that does not matter to certain reps who will vote on party line, not what is best for their constituents. I will be honest, I do support what Sanders wants to accomplish with having everyone insured. And yes, I will give the argument, we all use the fire department and ambulance and police. Healthcare should not be about profit, it should be about care, saving lives. 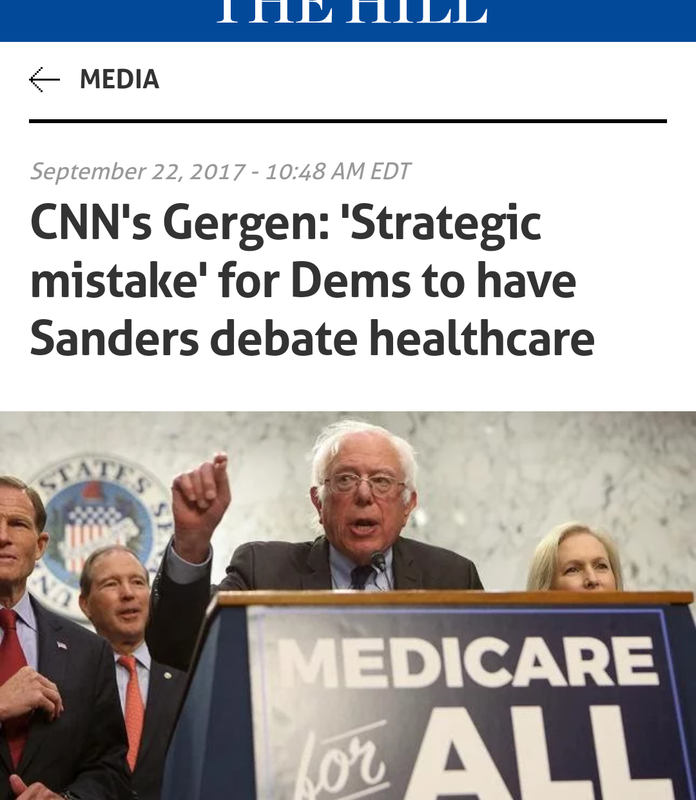 But a good point is raised by David Gergen. Right now, the focus needs to be, not even necessarily worrying about the Affordable Care Act, but worrying about the Graham-Cassidy bill, which is not even necessarily a GOP bill. If too much time is spent on hearing dog whistles like “Obamacare in death spiral” or ” “markets are failing” which nobody seems to prove true or false. But if you listen to too many dog whistles, you are going to miss what is actually important, having enough information to agree upon, that the Graham Cassidy bill should not be passed. Sure, Medicare for all is a good idea, just not tonight. Defending some aspects of the ACA, a good idea, just not tonight. 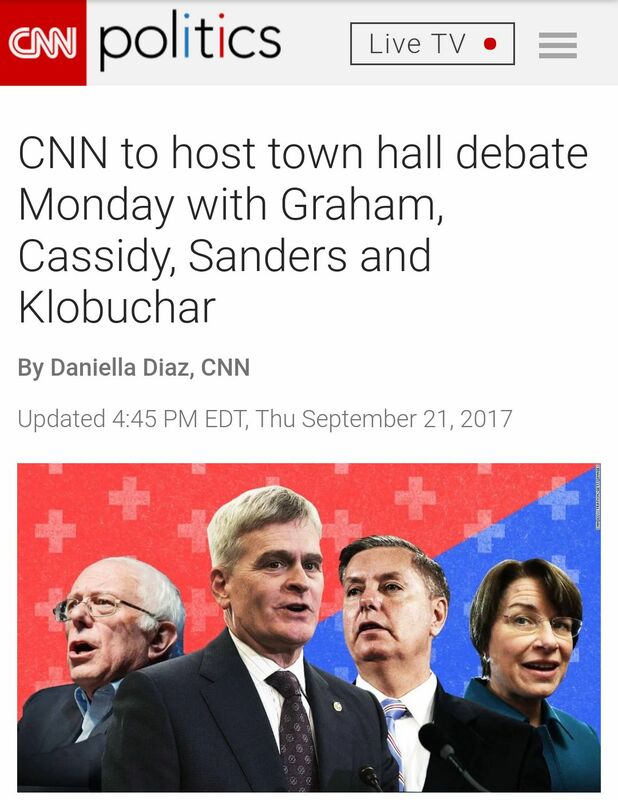 Watch tonight at 9pm on CNN. For some, you will have to forget the network you are watching, and maybe forget who the moderators are. Ultimately, you will hear from 4 of our government representatives, with at least three different ideas on healthcare. It will be their words. We can all watch this together, and have a civil discussion on what we heard. Be careful, I am a very good note-taker and be able to quote quite quickly. Because of my health issues, I have a genuine interest in health care. I also have a lot of knowledge about health care. I also have a heart that everyone deserves to have health care, that is not only affordable, but available. I do not believe that just because you give states permission to charge sick patients more is the same as leaving pre-existing conditions not discriminated. Fact, you allow patients to be charged more because they are sick, it becomes unaffordable. You do not get to call that leaving pre-existing conditions alone when patients are priced out of coverage, and die. I do not want to hear spin after tonight, neither for or against. All four individuals have the ability tonight to clearly state what everything is about. And after tonight, demand your representative to do the right thing, not just because of the nickname on the ACA.